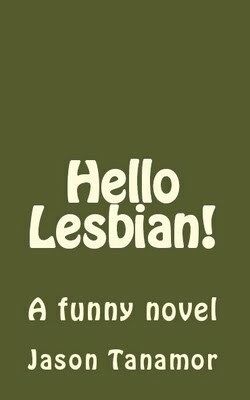 Hello Lesbian!, the seriously funny novel by Jason Tanamor, nicely blends a mix of light and dark humor with a raunchy stench of obscenity. The novel is influenced by Chuck Palahniuk (“Fight Club”) and Dave Barry (“Big Trouble”). “There is a strong sense of humor and in your face obscenity,” Tanamor said. The seriously funny novel’s synopsis is simple: A ladies man gives up the life of schmoozing women when he finds the love of his life. The only problem - she's a lesbian. Wally Bain has dated every single woman known to man. His reputation of being a ladies man culminates when he finds himself forgetting the names of the women he’s dated. Through pressure from his parents, Wally decides to settle down. However, when he finally meets “the one,” Wally discovers that not only is she out of his league, but that she’s also a lesbian. The true ladies man that he is, Wally berates her until she agrees to go out with him. The condition? That if it doesn’t work out, he will never, ever bother her again. What does Wally do? Well, since she’s a lesbian and likes women, Wally devises a fail safe plan – to develop all non-guy mannerisms to impress her. Wally transforms into something that he’s not used to and the result is a hilarious first date that will make Hello Lesbian! a classic. “This novel started from a real life experience. Years ago when I was single, I asked a woman if she wanted to go out sometime. She answered, ‘I’m sorry, I like women.’ I responded with, ‘So do I. We have something in common.’ The woman laughed and for one tiny moment in my small male brain, I thought I could convert her,” said Tanamor. “If you’ve ever met a ladies man, there is no obstacle. Hello Lesbian! is a sarcastic approach to that mentality,” Tanamor said. Binding Type: US Trade Paper Trim Size: 5" x 8"
Buy from publisher for $12.95 unsigned: https://www.createspace.com/3630819. 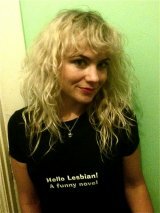 Read an excerpt here: http://www.zoiksonline.com/2007/06/excerpt-hello-lesbian.html. Friend Jason Tanamor now at: http://www.facebook.com/jason.tanamor.